Last Friday I was on the way back from some customer visits. While traveling in a German highspeed train I used the Wifi service, connected to IBM Bluemix and created a DB2 in-memory database. Let me show you how I set it up, what you can do with it and how I am connecting to the cloud-based database from my laptop. 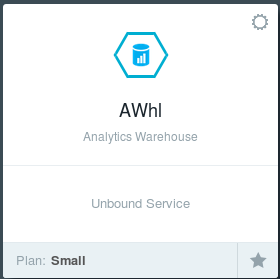 The first thing to know is that on Bluemix the DB2 in-memory database service is called IBM Analytics Warehouse. 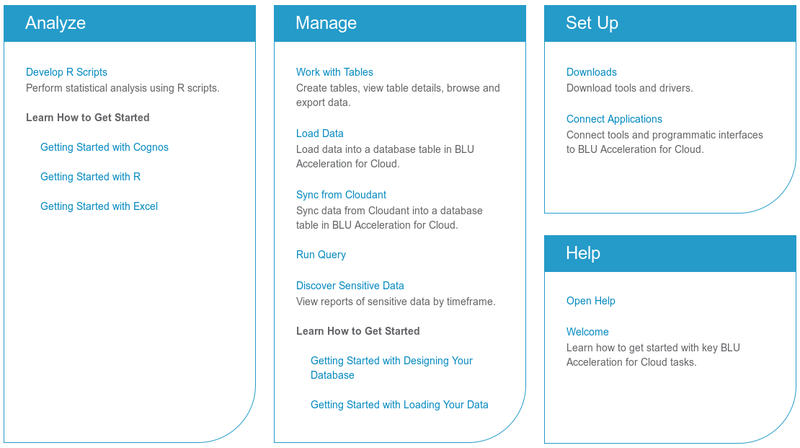 To create a database, you select "Add service" and leave it unbound if you want, i.e., it is not directly associated with any Bluemix application. That is ok because at this time we are only interested in the database. Once the service is added and the database itself created, you can lauch the administration console. The console supports several administration and development tasks as show in the picture. It includes loading data, to develop analytic scripts in R, to execute queries and link the data with Microsoft Excel for processing in a spreadsheet, and it has a section to connect external tools or applications to the database. You can set up replication from a Cloudant JSON database to DB2, so that the data stream is directly fed in for in-memory analyses. I didn't test it so far, but plan to do so with one of my other Bluemix projects. A task that I used is to (up)load data. For this I took some historic weather data (planning ahead for a vacation location), let the load wizard extract the metadata to create a suitable data, and ran some queries. 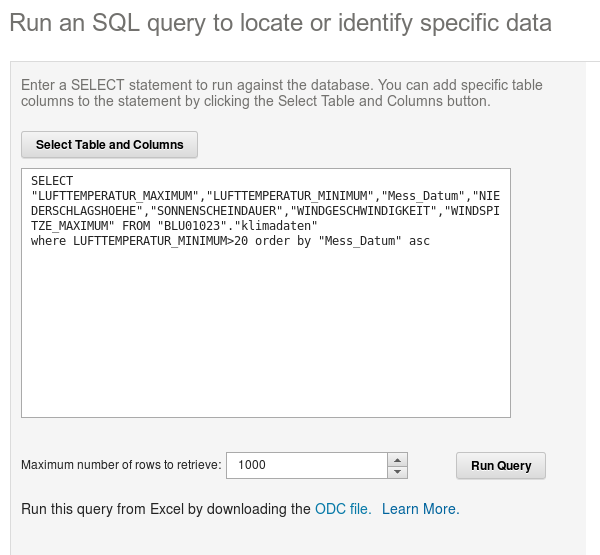 For executing (simple) selects there is a "Run Query" dialogue. It allows to choose a table and columns and then generates a basic query skeleton. I looked into whether a specific German island had warm nights, i.e., a daily minimum temperature of over 20 degrees Celsius. Only 14 days out of several decades and thousands of data points qualified. DB20000I The CATALOG TCPIP NODE command completed successfully. database directory or system database directory. DB20000I The CATALOG DATABASE command completed successfully. I will plan to develop a simple application using the DB2 in-memory database (BLU Acceleration / Analytics Warehouse) and then write about it. Until then read more about IBM Bluemix in my other related blog entries.